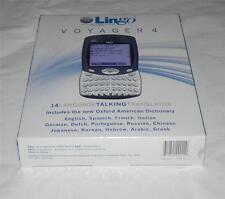 Lingo Voyager 4 Talking Translator. Never used. Batteries not included. This is a used working Lingo Pacifica Talk 10 Language Talking Translator, Model TR-2203. Translates over 80,000 words. Features: 10 Language translators English-German-French-Spanish-Portuguese-Turkish-Polish-Russian-Hebrew-Arabic. ModelTR 1650C. Lingo Direct TR-1650C Travelmate 16 Language Translator ,TR-1650C: Electronics - High quality, 2-line LCD display and durable fold-over take sized case; High quality, 2-line LCD display; Languages include English,German,Dutch,French, Spanish, Romance, Russian, Chinese, Japanese,Korean,Hebrew,Arabic,Greek,Portuguese,Swedish, Norseman;. LINGO GLOBAL TALK GT-1 Talking Language Translator 10 LANGUAGES English Spanish French German Portuguese Italian Russian Chinese Japanese Korean New in Package Enjoy! Lingo Model TT-6000 Eurotalk Traveller Talking Language Translator New in Box. Condition is New. Shipped with USPS First Class Package. Box has shelf wear but item is brand new. Out of box. Never used. In excellent condition. Batteries included in device. See pictures and message me if you have any questions. 30 day money back guarantee on most my items. If you are not satisfied with your product, please contact me directly first. Please do not leave negative feedback, open a case, or contact me with a “item not as described” message. Customer service is my main goal, I am always willing to help make my customers happy if a problem arises. Thank you. 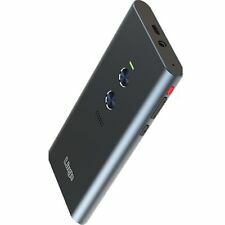 You are purchasing a Lingo6 Talk Six Language Translator with Case. Tested and works. Batteries not included. For sale is this Lingo Pacifica Talk language translator that is pictured. It is in good working condition. Included in this sale is the translator and manual. only and no other parts or accessories. Very good condition, although it needs new batteries. LINGO PACIFICA TALK Model TR-2203 10 LANGUAGE TRANSLATOR w/ Box & Case-NO VOICE! Ten Language Translator. PACIFICA TALK . For sale is this Lingo 26 language translator. Takes two 2032 batteries. I just put in fresh batteries to test it and they are included. Good used condition and tested. Manual not included. It is in good, tested and working condition. Item is used, so it has used wear like scratches, scuffs and etc. Batteries not included. BRAND NEW / SEALED Lingo Europa 6 Language Pocket Translator - FREE SHIPPING!!! Lingo 6 Language Multilingual Translator WM-6 Works Great . Condition is New. Shipped with USPS First Class Package. New in Package LINGO8, GLOBAL 8 LANGUAGE NONE TALKING TRANSLATOR TR-800A OVER 64,000 WORDS. Condition is New. Shipped with USPS First Class Package (2 to 3 business days). LINGO GLOBAL TALK GT-1 Talking Language Translator - VACATION - 10 LANGUAGES. Condition is New. Shipped with USPS Priority Mail. You are buying a Voyager II Talking Translator that is in good pre-owned condition. It includes the original box, Lingo case, reset pen/needle, and various instruction pamphlets. Minimal marks on the device however it does have a dead pixel line on the screen. This item has been gently used and incudes the instruction book and a a carrying/storage case. Translates French, Spanish, German, Italian and English. Grades assigned are my opinion. I try to give you the details I would want, if I was buying. 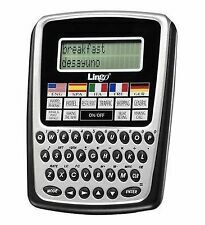 LINGO PACIFICA TALK 10 LANGUAGE TRANSLATOR new in box never used, model TR 2203. Looks very cleaned and used once. Requires batteries. We will do our best to solve the problem and give you a satisfying answer. I have for sale a used Lingo Continental TR-9802 Language Translator 14 Languages, No Batteries. In good used condition Lingo Global Talk GT10 10 Language Talking Translator includes Instruction Manual, earbuds, quick start reference guide and nice case. Works well, takes 2 AAA batteries plus one as backup. Lingo Talk Six Language Translator VT-9810/VT-9812 (missing battery cover). Condition is Used. Shipped with USPS First Class Package. No battery cover or batteries included. See photos. I am not going to fully test 8 Language's, but the little I did test was good. Model: TTV -4 . Lingo - The leader in Multi-language Translators. Type: Dictionary & Translator. Translator 14 languages: English, Spanish, French, Italian, German, Dutch, Portuguese, Russian, Chinese, Japanese, Korean, Hebrew, Arabic, Greek. This is a working translator that just needs a couple of AAA batteries and its ready to go. The case is also included but not pictured. 6 Languages: English Spanish French German Italian Greek. - Includes ear buds. - Includes 2 "AAA" batteries. - Shock resistant black rubber finish.